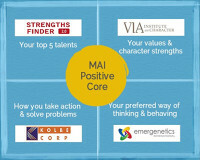 Includes all 4 MAI Positive Core™ assessments, one-page MAI Positive Core™ summary and a one hour debrief of the results with an Authentic Impact Coach. 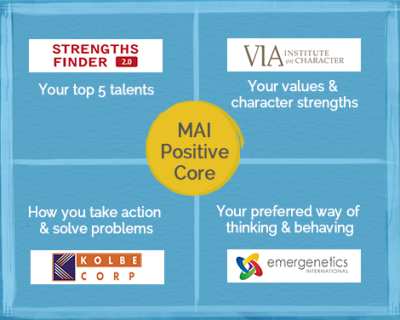 The MAI Positive Core™ combines the results of four highly respected assessment tools to create a comprehensive and actionable picture of you…at your best. The results are empirically sound and intuitively correct. It provides an immediate understanding of how you prefer to work and communicate and provides effective language to describe yourself. You receive insight into how you might be perceived by others, and gain clarity on why others might behave the way they do.